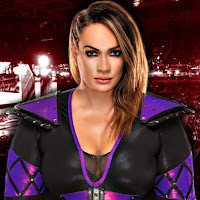 Below is new video of Nia Jax cutting a backstage promo on the first-ever women's Elimination Chamber match. Jax will face Asuka at the Chamber pay-per-view to determine who faces the RAW Women's Champion at WrestleMania 34, currently Alexa Bliss. Nia says the Chamber competitors are dreaming of winning the Chamber to go on to WrestleMania but their dream will just turn to a nightmare when they see her standing across from them at WrestleMania. The video also shows Jax going at it with Bayley at the WWE live event in Fresno this weekend.